Login to your Pinterest account now because you’re going to want to remember to make these strawberry and rhubarb inspired recipes just in time for your summer time soirées and special occasions. These recipes range from novice to pastry chef but we can all make something from this delicious roster. Don’t forget practice makes perfect so, invite some friends over and let’s kick off the strawberry and rhubarb season with these sensations! 1. Pull out all of the stops with this Gluten Free Strawberry Rhubarb Pie with Blueberries and star-studded crust from Gluten Free Mama! 2. Are strawberries out of season or just want more rhubarb in your life? Make these Gluten Free Rhubarb Crumble Bars and you can decide to make them solely with strawberries, rhubarb or both! 3. 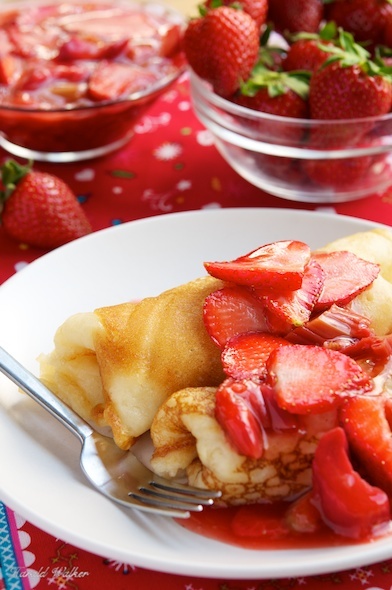 Instead of pies and crumbles, give this Strawberry and Rhubarb Blini a chance! Who knows? You may not even crave pies after trying out a blini. 4. The following combination of words and accompanying photo may make you hungry: Creamy Coconut Almond Tart with Rhubarb. You can easily make this vegan but first, we suggest you stop drooling and head to the store now! 5. The pineapple pieces in this Vegan Hawaiian Rhubarb Pie with Ginger Streusel Topping will bring you to paradise and will make your home smell oh so fragrant. 6. Make this light Rhubarb Moose vegan delight when you haven’t perfected your crusts and crumbles. 7. Not sure what a compote is? You’ll learn how to make it in this recipe for: Lemon Risotto Rice Pudding with Rhubarb Compote and you’ll probably want to try it on top of other things. 8. Who says rhubarb is only used for desserts? Try this Rhubarb Mustard on roasts and left-over roast sandwiches to give mustard a new flavorful kick. 9. Sip on this Beet and Rhubarb Soup for your health and wellness! 10. When baking is not an option, blend up this Strawberry Rhubarb Smoothie. Your home won’t smell like baked goods but you’ll save on time and calories. 11. If you’ve already perfected all of the recipes above or just needed to start that happy hour on a high note, try this Strawberry and Rhubarb Pie Martini and you’ll feel like a winner. Cheers!